Tony Woods, Kinetic H20, Super-8 film, 20 mins. Ema Sekimoto, Street Type, video, 2001, 7 mins. I photographed 200 street signs for this video project, and asked people to create meaning using the photos. Someone spent five minutes to lay all the photos, someone spent 40 minutes to choose his words from them. This is about people and how different everyone's thinking is. Ema Sekimoto, Zoo, video, 2001, 3 mins. This work is inspired by Haruki Murakami's novel The Wind-up Bird Chronicle, which has a part telling about zoo animals in war time. Filmed on Super-8 and DV. Ema Sekimoto, Memorabilia, video, 2001, 3 mins. This is about my dream when I was little. I dreamt the same dream almost every night, and that scared me. Something I can't understand myself and strange feeling inside of me. Nick Ostrovskis, Tasmania, Super-8 film, 1985-2001, 15 mins. A landscape / timelapse film of a trip to Tasmania. Tony Woods, Found Footage, Super-8 film, kine from Video 8. Kung fu flick fest, a bit of action and fun. Grant Meredith, Udds Armageddon, video, 11 mins 30 secs. The sequel to the famous Winter of the Udds, set in the middle of the great war of freedom against the terrifying genetically-altered rubber glove Udds. A tribute to the great post-nuclear sci-fis of the '50s and '60s. A tale of victory and despair. The war spreads out through many countries heading towards the devastating finale in Australia. Many men and Udds will die. Stu Thomas, Flamethrower, Super-8 film, 2002, 4 mins. Soundtrack by Stu Thomas and the Brass Bed. Centred around the theme of fire and its associations with destruction, cleansing and rebirth, with a bunch of random off-cuts from 10 years past cobble together to make an abstract fable of alien visitation and human transformation. Dominic Ryan, The Last Checkpoint, video, 2001, 10 mins. In February 2001 Dominic Ryan and cameraman Harrie Haebets from Amsterdam went into the West Bank of Israel or the occupied territories of Palestine, to erect on the green line in the besieged town of Qalqilya two humanitarian billboards and organise a meeting between the governor of Qalqilya and two knesset members. A ceremony was to be organised and a declaration of conflict resolution was to be exchanged across the no-man's land where both sides were congregating. The day before the ceremony, a bus driver from Gaza drove into the 12 IDF soldiers at a bus stop and killed them. The governor cancelled the event. This is an extract from this True Fiction movie - the city inn check point where the cameraman is gassed and shot in the middle of no-man's land. Peter Lane, Chrome, Super-8 film, 1998, 3 mins, 30 secs. A fish-eye view on the culture of chrome. Tony Woods, A Private Screening, video, 2002, 15 mins. Live accompaniment by John Aslanidis (saxophone). You are alone in the cinema, this video and sound are for your eyes and ears only. Victoria Armytage, ... and Other Adventures, Super-8 film, 2001, 9 mins 14 secs. Soundtrack by Brendan Harraghy. The difficult adventures of one person with different people to different places. Time inbetween spent watching the clouds go by. Roy Chu, Ema, video, 2000, 5 mins. The adventures of a curious girl, Ema. One day she climbs into an unknown world and starts her adventure with other amazing things and experiments. Japanese dialogue. Roy Chu, The Room, video, 2002, 4 mins. The images of the place where I am living and the story about everything in this place. Kristian Brennan, Fifty Pounds of Reproduction, Super-8 film, 3 mins. Soundtrack by Burbeque. A work that is in progress for a film about reproduction, repetition. One + one = 2. 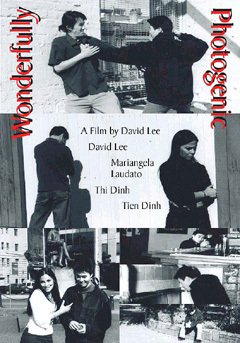 David Lee, Wonderfully Photogenic, video telecine from Super-8, 2002, 15 mins. Soundtrack by Dzung Nguyen. A university student suffers from two heartbreaking experiences, longing for love, wanting to love someone and be loved in return. One fateful day, he crosses paths with someone who reveals to him an unusual message of love, a love that is beyond the love between a man and woman, a love that excels the greatest of love, a love that is unconditional. There may be hope and love for this young man after all. Who knows? Brendan Harraghy, Dwellings in the Past, Super-8 film, 2000, 3 mins. Hector Hazard (UK), videos, total running time 7:14 mins.